How Does Alcohol Affect Your Mood? Approximately 17 million American adults ages 18 and older had an alcohol use disorder in 2012. Drinking alcohol in moderation is typically harmless, but binge drinking can seriously affect your mood. Alcohol affects men and women differently because of body types. It is important to be aware of the effects alcohol can have on your mood, as well as on personal relationships and long-term health. Having a glass of wine or beer after a long day can help you relax, but it is advised not to drink heavily in order to maintain emotional health. Alcohol is a depressant, which means it alters your brain chemistry, dulls your senses, and affects the neurotransmitters that transmit signals from one nerve to another. This is why motor skills - like talking and walking - become more difficult when you get drunk. This also explains why people feel more confident and less anxious when they drink, because the alcohol suppresses the part of the brain associated with inhibition. Many studies have been conducted on the effects of alcohol on the brain and moods. One study that was published in the journal Alcohol and Alcoholism looked at how alcohol affected the mood of men and women differently. Researchers initially thought that the subjects would experience happiness with drinking, but the subjects reported less happiness. Male participants were more prone to get angry and aggressive after drinking, while women were more inclined to feel depressed after drinking. 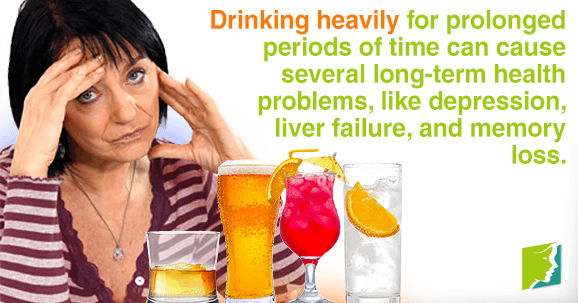 Drinking heavily for prolonged periods of time can cause several long-term health problems. People who frequently binge drink are more likely to develop depression, liver failure, and memory loss. Along with the numerous health problems, heavy drinkers experience relationship and financial problems. In 2006, alcohol misuse problems cost the United States $223.5 billion. Additionally, in 2012, 3.3 million of all global deaths were alcohol-related. These ripple effects can all indirectly contribute to low moods. When it comes to drinking, it is important to stay in control. A glass of wine or beer at the end of a long day to relax is fine, but binge drinking is when problems can arise. Heavy drinking can encourage feelings of aggression, anger, and depression in both men and women. Helpful tips to avoid this from happening are keeping track of how many drinks you have had and eating and drinking water throughout the night to help lessen the effects. Nearly 88,000 people die from alcohol related causes annually, making it the third leading preventable cause of death in the United States. Drinking alcohol can help you relax and even bring about feelings of happiness and giddiness when consumed in moderation, but binge drinking typically causes problems. It is important to stay in control and be aware of the negative effects alcohol can have on your body and mood. Read more about mood swings during menopause. Why Do I Have Mood Swings and What Can I Do? Many women notice mood swings or other changes in line with certain lunar phases. Keep reading to learn more about mood swings. Mood swings are an unpleasant side effect of menopause, and are caused by your hormones. Read on to learn more.